It’s hard to beat the classic char-grilled taste of wild-caught Salmon. 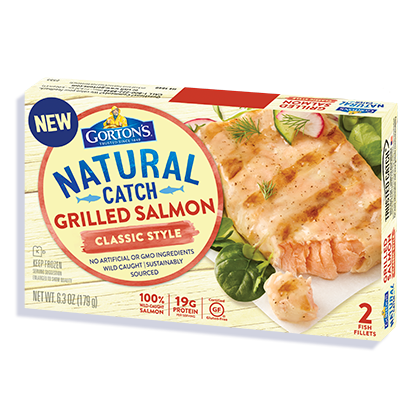 Especially when it’s made with only the finest ingredients like sustainably caught Salmon and no artificial ingredients. Pair it with rice or salad for a naturally delicious meal. 2. Arrange seasoned side up on a metal baking pan. 3. Bake for 15-17 minutes*. *FULLY COOK FISH TO AN INTERNAL TEMPERATURE OF 155ºF OR HIGHER BEFORE SERVING. 2. Microwave 1 fillet on HIGH for 3 to 4 minutes**, or 2 fillets for 5 to 6 minutes**. **FULLY COOK FISH TO AN INTERNAL TEMPERATURE OF 165ºF OR HIGHER BEFORE SERVING. Water, canola oil, potato starch, cane sugar, natural flavor, sea salt, spices, onion powder, citric acid, whey.